Thailand is ranked first among Southeast Asian countries in terms of the ease of setting up a company and doing business. Foreign investors find Thailand with its healthy business and macroeconomic environment an excellent investment destination. If you are considering starting a business in Thailand, you’ll be more than happy to know that here the number of formal procedures required to register a business property for foreign investors is the smallest in the region. Thailand’s welcoming culture and high quality of life add to the overall attractiveness of the country, making it a perfect location for doing business. Thailand’s finance and business center is located in Bangkok, the capital of the country. Numerous multinational corporations have opened their regional headquarters here. Bangkok is also a major Southeast Asian air hub served by two international airports, which operate regular international flights to the Asia, US, Europe and Australia. On average, a direct flight to Bangkok from the US is about 20 hours long. The exact duration of your flight will obviously depend on the exact location of the airport from which you depart and on the layover duration. A flight to Bangkok from the US is almost a full day long, and you’d probably want to feel comfortable while being on board for so long. That’s exactly why we strongly recommend that you choose business class if you are planning a business trip to Bangkok. The seats in premium class are spacious and very comfortable, which is especially important on a long flight. But the comfort of the seats is far from being the only advantage of business class. The distance between the seats is large, while the number of fellow-passengers is a lot smaller than in economy class. The food served in business class is of the highest quality possible and the menu is very varied. Of course, great service costs great money. Luxury seats tickets are very expensive. 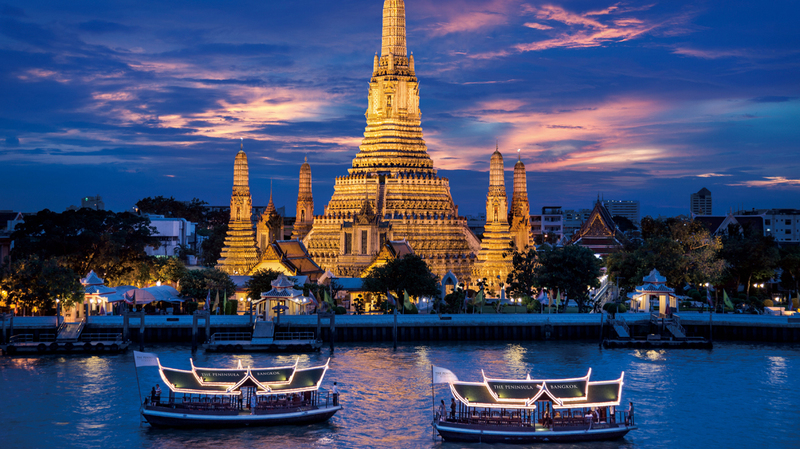 Discounted business class tickets to Bangkok are hard to get, but you can still find amazing deals and book a cheap flight if you know where to look. CheapFirstClass.com guarantees the best price-quality ratio of airfares to Bangkok on the market. At CheapFirstClass.com, we regularly offer last minute specials and great deals on business class flights to Bangkok. Enjoy the luxury of cheapest first class airfares to Bangkok for the lowest price with CheapFirstClass.com.